Melville wrote from a bedroom in his Arrowhead home in Pittsfield, MA. Where do you write? It’s a question that emerges frequently among writers. Next to the imagination, our own personal space is often the most sacred thing we have. And the answer varies tremendously. 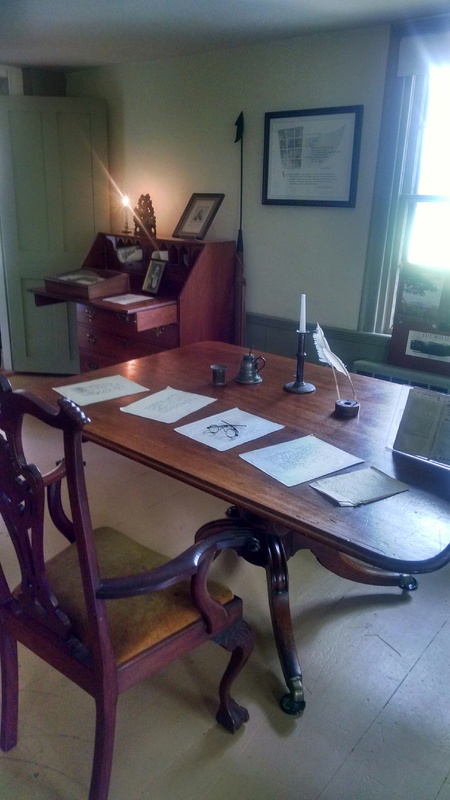 Like Herman Melville, Flannery O’Connor wrote from a desk in her bedroom. And although the Mount included a sumptuous library, Edith Wharton wrote from bed, with her little dogs curled up at her feet! The ultimate introvert, Nathaniel Hawthorne, wrote standing up from a podium in front of a blank wall, eschewing the distractions of the outside world. And although Carl Sandburg’s family ceded a front room with an expansive window to him at Connemara, he, too, preferred a smaller interior room at a desk turned away from the window. As for me, I have tried numerous locations, including a little study in the front of the house, surrounded by the books of my favorite authors. As you can see from the picture below, however, Huckleberry Finn quickly appropriated this space for his own watch tower. And in spite of his literary name, he and I have very different job descriptions. dog/dôɡ/: a domesticated carnivorous mammal that typically has a long snout, an acute sense of smell, and a barking, howling, or whining voice. It is widely kept as a pet or for work or field sports, unless that work includes writing. writer/rahy-ter: 1. a person engaged in writing books, articles, stories, etc., especially as an occupation or profession; an author or journalist. 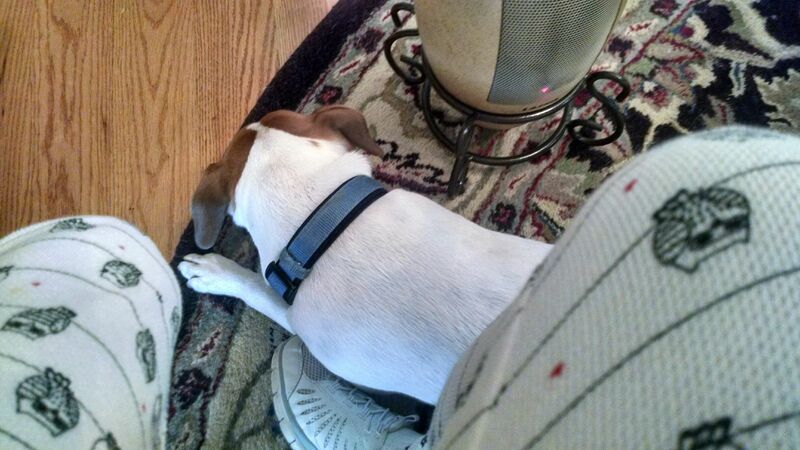 2) Unlike you are Edith Wharton, a writer’s work space rarely includes a dog. The same barking and whining that makes our dogs so charming does often, regrettably, interfere with the reflection needed to write. In spite of this fact, many a writer owned a dog (Dickinson, Lord Byron, and Wharton, to name just a few) and these canine friends enrich our lives tremendously. But that is the subject of another post, I am sure. As for me, I prefer to write at our kitchen table overlooking a north window. Being a bit of a literary hoarder, I find it useful to have plenty of space to spread out notes, reference books, index cards, and the like. I write primarily from my laptop, and I appreciate the occasional glance at the natural world, and the little dark-eyed junco skittering across the fall leaves. From where I’m sitting, I can hear the comforting hum of the dishwasher or clothes dryer, which reminds me that the “other” work of the day is nearly done. And of course, because writing requires much brain power and therefore frequent sustenance, being close to the pantry is always a good thing. In addition to having a semi-permanent writing space, I also carry a little notebook wherever I go so that I can scribble notes as the spirit moves me. I’m currently consolidating all of these notebooks, cards, etc., into one bigger notebook so that I can more easily draw connections among assorted scribblings. What about you? Where do you write? Despite our different job descriptions, we always manage to end up in the same space, however. 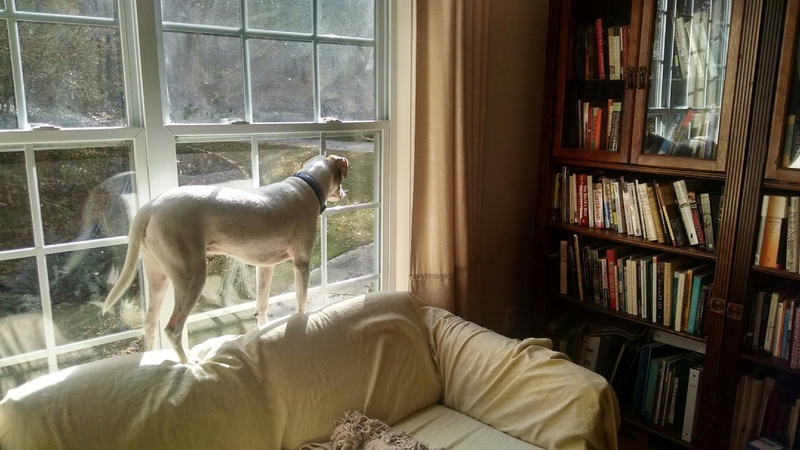 This entry was posted in Uncategorized and tagged dickinson, dog, Flannery O'Connor, hawthorne, inspiration, melville, wharton, where do you write, writing, writing desk, writing space on October 31, 2015 by Ashley Memory.